I just wanted to say thanks for following along with my journey so far. I am extremely humbled by the amazing support and kind words you have given me. With that being said, I wanted to show y'all how much I truly appreciate you by doing a little giveaway. I know summer is quickly coming to an end, which means less free time, but I absolutely love reading. I like to dabble in books written by nurses from time to time and thought this one was really good. For that reasons I want to give away a copy to one of my readers! "Shalof, a veteran ICU nurse, reveals what it is really like to work behind the closed hospital curtains. The drama, the sardonic humour, the grinding workload, the cheerful camaraderie, the big issues and the small, all are brought vividly to life in this remarkable book." You can read all about Tilda here. 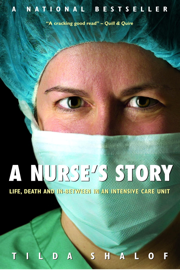 She is most noted for writing about her experiences as an ICU nurse for the past twenty-four years. If you would like to win a copy of A Nurse's Story then all you have to do is enter here or use the gadget(US residents only please). Good Luck! Giveaway is open till 8/26/2015 at 12:00 AM Eastern Time. Sounds like a good book! Right now I'm reading " I wasn't strong like this when I started out" it's really good and I recommend it! Do not worry I will do another giveaway you will have a chance at soon! I think I'm most excited for clinical!